The purpose of this book is to examine the birth of bilateral strategic arms control between the United States and the Soviet Union during the Johnson Administration, from 1964 to 1969. It is about the time and the place of the birth of bilateral strategic arms control as it came about in the United States through the efforts of President Lyndon Johnson and Secretary of Defense Robert McNamara in the 1960s. This is the time of the birth of what quickly came to be known as SALT, or the Strategic Arms Limitation Talks. This inquiry firstly considers whether the move towards bilateral strategic arms control was institutional or personal. It then looks for the motivating factors: both theoretical and substantive. As few things have only a single cause, it is likely that we shall find that the birth of strategic arms control was influenced by both nuclear weapons employment theory, and by a substantive incident or reality such as the ever increasing number and sophistication of nuclear weaponry. Lastly, we must look for an immediate precipitating factor, such as the move towards deployment of a potentially destabilizing ABM system by both the USA and USSR. Therefore, it must be borne in mind when examining the people and their theories, the institutions, the prevailing realities, and major precipitating factors, that they all come together to form the basis for the birth of bilateral strategic arms control. This book shall therefore strive to reveal the extent of personal input; the objective basis for that personal commitment; and examine the major precipitating factors, namely Anti-Ballistic Missiles (ABM), and to a lesser extent, Multiple Independently Targeted Re-Entry Vehicles (MIRV). Although barely discussed at the time, the MIRV would turn out to be a major arms control problem: far greater than the hotly contested ABM system which spurred so many debates. 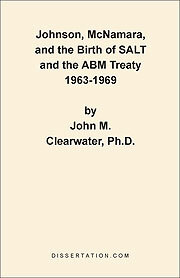 The unique aspect of this research is that other writers have concentrated almost totally on the people and events surrounding the Nixon Administration when studying SALT. While it is true that the talks did not get underway during the Johnson years, this study will show that all of the theoretical and preparatory work was done in the Johnson years, and conclude by showing that many of the same people appear in the Nixon years. Without the input of McNamara and his team, there would have been no movement on strategic arms control until possibly the 1970s. To add to the historical value of the work, I have included in the annexes complete texts of the initial arms control proposal which the US team was to present to the Soviet Union in the autumn of 1968. In addition, presented here for the very first time are the full instructions to the negotiating team and the initial presentation paper to be read by the team leader on the opening day of the talks. When this final material is tied in with the history of the push for the talks, the story is indeed exciting and meaningful. For the first time we are presented with the almost complete picture of the formulation of an arms control proposal. There is of course a fluke of history which brought this all to light. As the Johnson material was never directly used in the formal SALT talks, it was not subject to the same stringent security classifications as those of Nixon, Ford, Carter, Reagan, Bush and Clinton materials. Therefore the documents started to be declassified in the late 1980s, with the bulk coming to light in 1991 through 1994. Here then is the story of the origins of strategic arms control.